Six years ago when my daughter started preschool, I found companions of heart in other mothers. The director of the preschool hosted a book club in her home, bringing together two of my favorite subjects under one roof: literature and motherhood. Halfway through the year, taking advantage of Poetry magazine’s offer to send out free copies of its yearly Translation issue to bookclubs, I attempted to put poetry on the map for our little group. I also (the teacher in me) passed out a handout of compiled poems which included Thom Gunn’s Baby Song, Brigid Murnagham’s For my Mother, Anne Sexton’s Pain for a Daughter, Eavan Boland’s Dawn, Sylvia Plath’s Baby Song, Joan Logghe’s twenty six, Mark Strand’s Where Are the Water’s of Childhood, and D.H. Lawrences’ Baby Running Barefoot. Once we were all assembled with our coffee and spritzers in hand, I asked, “What did you think?” After a half minute or so of silence, our preschool director (who kept us frequently in stitches with her childrearing stories and really should write a book of her own) read a poem of Wendell Berry’s to us from a volume her sister mailed to her. One member read a sweet poem she’d written herself in sixth grade. And that was about it; my friends resumed an earlier conversation about fundraising money for the children’s school. In fairness to the group, I found the introductions to each of the translations compelling and poetic, whereas the actual poems didn’t lend themselves so easily to newcomers to poetry. I found myself tongue-tied and unable to stand up for my first love (poetry), unable to woo my companions by reading aloud even Firefly Under the Tongue by Coral Bracho, which begs to be performed. And frankly, I’ve been as guilty as the rest of the bookclub members (after three minutes of discussing The Bean Trees or Rain of Gold) of dodging the material at hand in favor of a second chocolate-chip cookie, steering the discussion back to what keeps me up at night: troubleshooting junior. But I left that evening questioning the importance of poetry-at least for a good couple of hours. As a mother with an MFA, I wanted to know: what might hold the interest of these other women who infused my daily life with the energy to keep going, face my children, my husband, and most importantly: myself? When the opportunity arose to come on board as poetry editor at The Fertile Source (an on-line zine founded and run by Jessica Powers where one can find writing and artwork on all aspects of birth, fertility, labor, miscarriage and adoption), I said yes, despite the slow modem on our acre in the redwoods, my three young children, the five feral cats, the fact that our family is straddling two cities in order to stay ahead of our mortgage, and finally, the draw to write and send out my own work. Despite such a list, here was the opportunity to be a small part of bringing accessible, unflinching, at times pithy, at times lyrical, poetry to an international audience on the web. I hope the poems not only provide a mirror for women and their families facing similar life experiences, but also that collectively they shed light on our understanding of what it means to be female and be born with the privilege, or at least the expectation of, the ability to give birth. And all that follows: the utter transformation of one’s marriage, relationships to prior children and oneself, the inescapable morphing of the physical body, the devastating grief that encompasses the inability to bear a child. Saying yes to the job was easy; actually engaging with the nitty gritty of choosing poems and having to write rejection letters continues to prove challenging. With Jessica’s help, I settled on a standard rejection note, suddenly understanding one uses a form rejection not for lack of empathy or care, but due to the importance of keeping a respectful, professional relationship with the writers offering their work. When time allows, I will add an extra sentence or two. I also enjoy working with writers willing to make minor edits; when the work stays with me, and there’s some small change we can make to streamline the poem, I’ll go out on a limb and make a suggestion. The joy of the job comes via the range of submissions and viewpoints. The subject matter can’t help but be rich and intense, whether writers are focusing on a miscarriage, the fears and joys they hold out for their unborn children, or the exhaustion and elation of those first few months as a brand new parent. 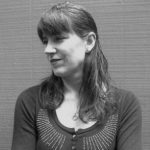 With a mere six months behind me as a poetry editor, I decided to ask a couple of more seasoned poetry editors about their experiences, specifically asking what they found the most challenging, and the most rewarding about the role. I also asked them about their own current writing projects…. The most challenging aspect of editing a literary publication is time-editing a work takes an enormous amount of it-not just selecting pieces, assembling the manuscript and publishing, but also communicating with the writers and promoting the book. Of course, in larger publications, these duties are shared, but there are a surprising number of small presses and literary magazines that are one or two-person operations. Another challenge is communicating gently with those whose work is not accepted for the publication. For each issue, we must turn down more people than we accept. Often these are writers whose work is respected and has merit, but just didn’t fit with the issue. Or new writers, whose work isn’t so polished, but we don’t want to discourage them. As a writer myself, I appreciate publications that communicate respectfully, whether good news or bad! Foremost in the rewards of editing is the little shock of pleasure when, in ploughing through a mountain of manuscripts, you read something wonderful! It is also rewarding to “discover” new writers. 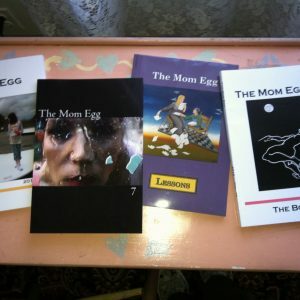 The Mom Egg (an annual collection of work by and about mothers) has been the initial publication venue for several poets who have gone on to publish and perform in many other places, to great acclaim. It’s satisfying to help nurture those talents and share those voices. Selecting works and piecing together a manuscript is also enjoyable. Much like a single author’s poetry book, an anthology must live as an organic whole as well as a collection of great individual pieces. Discovering the “body” of the collection is often somewhat like sculpting, where you remove excess material to reveal a form. This is a creative exercise, and very satisfying. An editor of a literary publication is also creating a community, not only of work but of people. 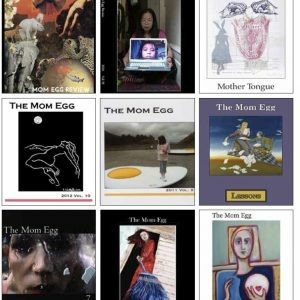 Through my participation in Bowery Books (an independent poetry press) and The Mom Egg, I’ve had the opportunity to meet an extraordinary group of writers, whose work and lives have inspired me.